Water has become a hotly contested political issue over the past few decades. The famous Mark Twain quote “whiskey is for drinking; water is for fighting over” illustrates California water wars like no other. We have always been a nation that has managed out of crisis, instead of being proactive, which has brought California’s farmers and ranchers to their knees and our states $36 billion agricultural economy to its breaking point. California’s population is nearing 37 million and over two-thirds of our states population lives in the arid desert. In order for our state to flourish, water management plays a key role in conveying water from the north state to dry Central and Southern California. As the Sacramento-San Joaquin Rivers top the list as the most endangered rivers in the U.S. by conservation groups, it is clear that our government has failed as water managers. While many state and federal agencies scurry to find the solution to the problem of our failing ecosystem, inadequate flood control, and declining fish species, California farmers are paying the high price of political bickering and inaction. In addition, California’s water crisis is a man-made problem; the drought we are experiencing is not only because of record low rainfall totals, but has been caused by the 1973 Endangered Species Act (ESA) that elevates plants and species above mankind. The ESA is wielded by environmental activists and feared by residents in rural communities. The recent court ordered water cutbacks in pumping from the Sacramento-San Joaquin Delta to protect the endangered delta smelt has exacerbated the water crisis in California. The reduction in pumping, combined with some of the lowest water allocations ever announced, has California farming communities’ unemployment rate hovering near 40 percent. This is the first year that California has experienced a drought since Congress enacted the Central Valley Project Improvement Act (CVPIA) in 1992, which allocated over 3 million acre-feet of water away from farms to protect the fisheries. The investment in Delta fisheries has only led to a decreasing number of fish species returning to spawn and the closure of salmon fishing in the Valley. 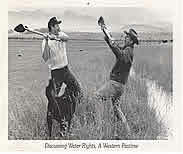 Furthermore, some of the most supreme water rights are held by north state farmers, ranchers and irrigation districts. For the past few months words such as “reallocation” and “reappropriation” of water rights have become common place terms, causing great concern to north state residents.